Tickets are FREE (although donations will be accepted at the door). Because seats are limited, registration is required. Please register through EventBrite using password River2019. This project was supported by a Watershed Stewardship Grant, a program of the Land Stewardship Centre, as well as our own operational funds, and support from City of Calgary Water Resources. We appreciate the support provided by these partners which allows this important citizen science project to proceed. 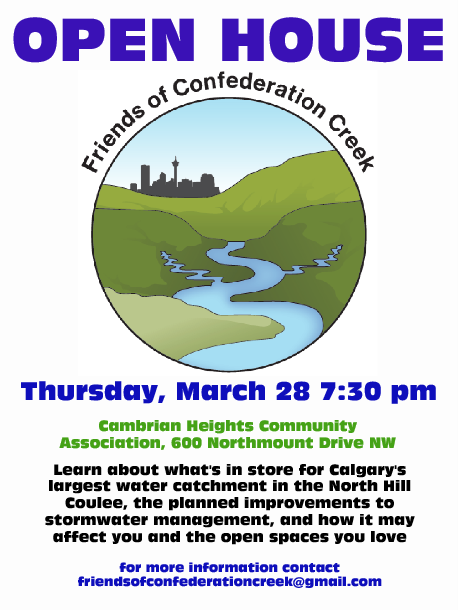 Calgary River Valleys has been working with other groups to count Brown Trout redds or spawning nests in the lower Elbow River since 1994, and has been the main sponsor of this important project since 2009. We want to ensure this citizen science continues as an annual count in order to ensure the data collected is as accurate as it can be, that trends over time can be observed, and the location of redds can be used to ensure land use decisions don’t negatively impact Calgary’s blue-ribbon trout fishery. In 2018, we were able to include, for the first time, data collection on Brown Trout redds in the Upper Elbow on the western edge of Calgary to establish a baseline in that reach. These counts are conducted in November after spawning by the Brown Trout has occurred, a behavior that is triggered by water temperatures becoming sufficiently cold in the late fall. On Friday November 9, 2018 university students, members of the public, and environmental experts rafted and walked in the Lower Elbow River to count the number of Brown Trout spawning nests in the approximate 12 km reach between the base of the Glenmore Dam and Fort Calgary, where the Elbow River meets the Bow. The Lower Elbow count was again conducted with the expertise of Senior Biologist Chris Bjornson from Golder Associates. Chris has advised us that it is likely that the majority of the Brown Trout spawning in the Elbow River spend most of their time in the Bow River, and swim up the Elbow to spawn. Unlike salmon, trout do not die after spawning, and can return the following year. We were aware that lower water levels were maintained this year during the Glenmore Dam infrastructure upgrades, and low water levels can have an effect on a fishery. We were concerned that lower water levels would have meant that sediments that ordinarily would be swept downstream may have settled and might have had an effect on the number of redds we found, as trout prefer to spawn in areas with minimal silt or sediment. However, this did not appear to be the case, since the number of recorded redds continued its post-flood increase up to 257 in 2018 from 231 in 2017. The data from 2018 on the Lower Elbow River suggests a trend toward returning to the levels of spawning activity that were observed prior to the 2013 flood. For the first time, Calgary River Valleys also completed a count of Brown Trout redds on Sunday November 18, 2018 in an approximate 6 km section of the Upper Elbow River, between the approximate mid-point of the Glencoe Golf and Country Club and the eastern end of the Elbow Springs Golf Club. For this Upper Elbow count, CRV recruited all the volunteer counters through articles placed in community association newsletters, asking citizens whether they wanted to go for a guided hike in the Elbow River. The Upper Elbow count was completed under the direction of Elliot Lindsay, Project Biologist at Trout Unlimited Canada. By the date of the count on November 18th, the river had already begun to ice over in many sections, so the counters had to be careful where they stepped to avoid falling into the water when the ice invariably broke at the transition from river’s edge covered in ice to faster-flowing open river. This count was completed without raft support as that section of the river is generally shallower, and would have been difficult for rafts to navigate. This section of the river also contains several side channels, which required our crew to break into groups to ensure no potential spawning habitat was omitted from being surveyed. The results from the Upper Elbow survey provided a baseline of a total of only 11 redds counted in this approximately 6 km stretch of river. In this count the redds were classified as to whether they were “definite” redds, as indicated by a recognizable pit and tail spill with clean substrate, “probable” redds, as indicated by a recognizable pit and tail spill with dirty substrate, or “possible” redds, with no recognizable pit or tail spill area. Of the 11 redds counted, 7 were definite redds although one may have been a Brook Trout redd rather than a Brown Trout redd (as Brook Trout create redds that are smaller in size), 1 was a probable redd, and 3 were classified only as possible redds. See the data chart for the Upper Elbow River section surveyed below. Unlike Brown Trout that spawn in the Lower Elbow, which are limited to the approximately 12 km section below the Glenmore Dam, Brown Trout in the Upper Elbow have approximately 65 km of river in which to spawn, between Elbow Falls and the Glenmore Reservoir. It is perhaps not surprising then that few redds were located in the approximately 6 km section of the Upper Elbow River that was surveyed. As it turned out, this section of the river also had relatively few sections with suitable spawning habitat, including small enough rocks and gravel for the female trout to move with her tail, and water with low amplitude rapids or riffles. To view a short (3:15) video clip from our YouTube channel of our volunteer Biologist, Chris Bjornson, of Golder Associates, explaining how Brown Trout spawn each fall, what the citizen scientists doing the count should be looking for, and why this annual redd count is important, click here. You’ve heard of Home Makeover shows, well in a similar fashion, this year Calgary River Valleys is doing a “Riverbank Makeover” project with a homeowner who backs onto the Elbow River, with funding support from the City of Calgary. This project is in alignment with the City’s recently adopted program, the Riparian Action Program, which is designed to improve and maintain the health of river-adjacent areas as well as the quality and quantity of water flowing through Calgary’s rivers and creeks. Many people are unfamiliar with the term “riparian”. Its Latin root “ripa” means bank or shore, so riparian refers to the transition zone between the river and the surrounding lands or uplands. This is land where the vegetation and soils are strongly influenced by water. As a result, different types of plants can grow in the riparian zone as compared to the surrounding lands or uplands. Educate the public about the value and function of riparian zones in our ecosystem. We completed our volunteer planting day on October 6th, and we will be holding a “garden tour” style event on October 20th from 1 pm to 3:30 pm, to see what was planted, where, and why. Contact us at CalgaryRiverValleys@outlook.com if you are interested in attending the “garden tour” style event. See below for some pictures of the transformation of the riverbank. Hover over each picture to see a short description of what is in the photo. The ten latest CRV Tweets on Twitter. Stay connected with the Calgary River Valleys through our Social Media links. It’s a great way to stay up to date on the latest information regarding our waterways. Be sure to view our map of Calgary’s rivers, creeks, wetlands and watershed resources. We’re avid photographers in addition to nature enthusiasts. It only follows that our members have a lot of great photos to share. Read CRV publications, articles and past editions of the Ripple Newsletter. Have important Calgary River Valleys news and updates delivered to your email inbox. it’s a great way to stay informed on issues that may be of interest to you.